Nations are trying to tamper with God’s dwelling place on earth, and are suffering serious injury as a result. It is instructive to note what has happened to Britain, Germany and France since Donald Trump’s brave decision to move his embassy to Jerusalem in recognition of Israel’s 3,000-year -old capital. As writer and theologian Frank Booth reminded me, European leaders May, Macron and Merkel joined the chorus raised against the decision. Taking their cue from the politically-correct secularists, they defiantly refused to follow Trump’s example, and all three are now in grave difficulties. Open warfare over Brexit threatens to bring further chaos to Britain including the distinct possibility of a government led by Jeremy Corbyn, an ally of terrorist groups wishing to obliterate Israel who shows no sign of lancing the boil of anti-Semitism within his party. Merkel, meanwhile, has a fragile hold on power as Germans express great frustration with the problems caused by mass immigration. And deadly street riots – led by a movement reported to be grossly anti-Semitic – erupted in Paris in protest at Macron’s ‘reforms’. Such a triple calamity can be traced back, quite simply, to defiance of the God of Israel and of his commandments which have formed the basis of Western civilisation. Bethlehem may have been the Messiah’s birthplace, but Jerusalem – just six miles away – was and is the key to the world’s future. It was there that our Lord died as the perfect sacrifice for sins, where he rose from the dead three days later, where he subsequently ascended to heaven after appearing to more than 500 witnesses, and where he will return, probably in the very near future judging by the many signs of his coming already being fulfilled. 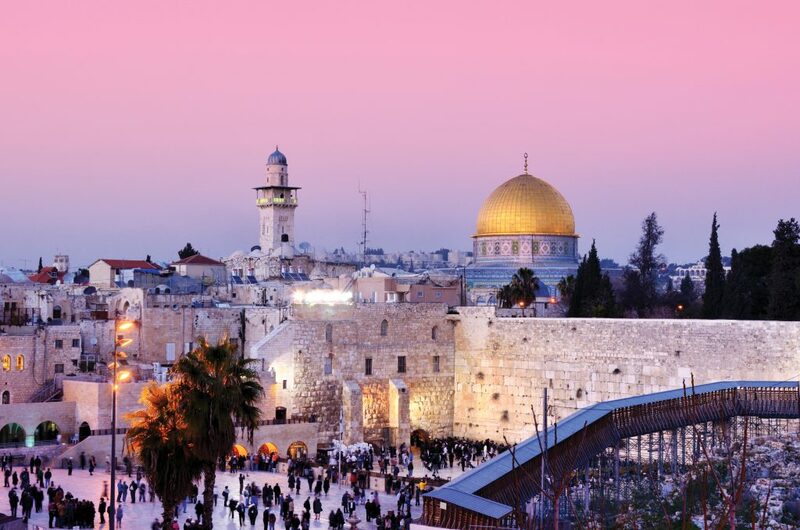 The most obvious of these has been the rebirth and rise to prominence of the state of Israel, symbolised in the Bible as the fig tree (see Matthew 24:32-34). But as the Scriptures also predicted, the Jews would not be welcomed back to their homeland by their neighbours. So how does this affect the UK and why is this issue – and not Brexit – the source of our difficulties? Britain was granted the inestimable privilege of facilitating Jewish repatriation thanks to godly men like Wesley, Wilberforce and their evangelical successors whose influence caused the government of 1917 led by David Lloyd George to issue a promise to do all it could to make this possible through what came to be known as the Balfour Declaration (signed by Foreign Secretary Lord Balfour). But in spite of later reneging on this pledge and betraying the Jews – even refusing entry (to then British-controlled Palestine) to thousands of would-be immigrants trying to escape the Nazis – Israel’s re-birth proved unstoppable. And as we kept capitulating to Arab intimidation, the Israeli-Palestinian conflict worsened and our great empire – on which the sun never set – began to systematically fall apart in direct fulfilment of Genesis 12:3, which promises blessing to those who bless the seed of Abraham and cursing to those who don’t. In addition, Joel 3:2 guarantees judgment on the nations that have scattered God’s people and divided up their land. All the talk now is of a ‘two-state solution’, carving up territory designated (both by God and international treaties) as belonging to the Jews. Jerusalem is the key to all this. Plans for dividing the city into east and west in order to achieve peace are actually a recipe for further bloodshed as Israel’s enemies want all of it.1 The last great war, the Bible says, will be over the status of Jerusalem, not Europe or the Far East. And Scripture is clear that our security as nations and individuals depends on our attitude to Jesus, to the Jews and to Jerusalem (John 3:16, Genesis 12:3, Psalm 122:6).